Background: Knee Osteoarthritis (OA) is a disabling musculoskeletal condition among the elderly. Self-reported instability is one of the impairments associated with osteoarthritis. 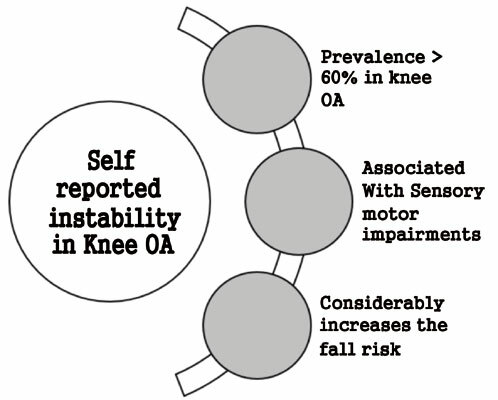 A complete understanding of the self-reported instability in knee OA is essential, to identify the best strategies for overcoming this impairment. The focus of this scoping review is to provide an overview of evidence supported information about the prevalence and other associated features of selfreported instability in Knee OA. A broad search of the database PubMed with keywords such as knee osteoarthritis and instability resulted in 1075 articles. After title abstract and full-text screening, 19 relevant articles are described in the review. Overall, there is less amount of published literature on this topic. Studies reported prevalence rates of more than 60% for self-reported instability in knee osteoarthritis, which causes functional deterioration and high fear of falls. The most probable causative factors for self-reported instability in knee OA were altered sensory mechanisms and decreased muscle strength. Conclusion: To conclude, self-reported knee instability in knee OA requires thorough evaluation and directed treatment with further studies providing rationalistic evidence-based management strategies. The current literature regarding self-reported knee instability is summarized, highlighting the research gaps. Degenerative joint disease, osteoarthrosis, stability, unstable, instability, knee.